The Develop module in Lightroom, as the name suggests is where you “develop” your images. 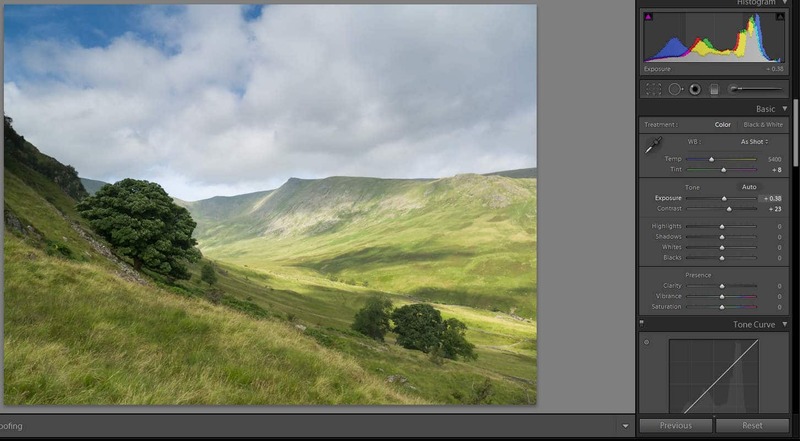 Whilst it’s quite common to think of this module being used to develop RAW files into images, it can also be used to make adjustments to images already in picture formats such as TIFF and JPG. Whilst I will be focusing here on RAW files the principles are similar for adjusting TIFF’s and JPG’s although you will notice some minor differences in the interface. 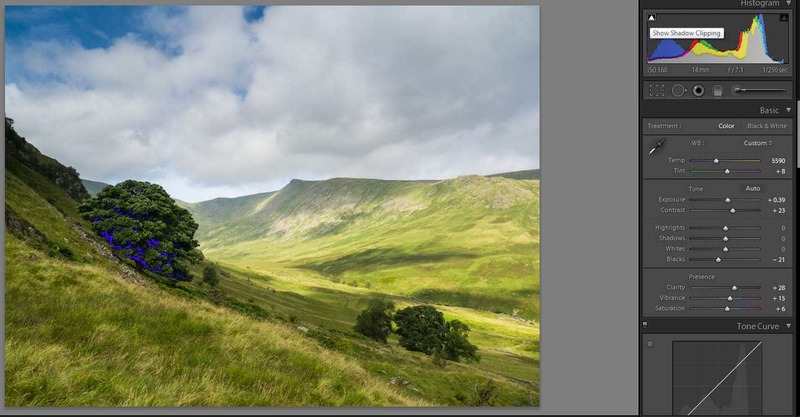 The Develop module is selected using the “Develop” link in the top right of your Lightroom desktop. Click this and you will see a working area similar to that shown below, with your currently selected image displayed in the centre. If you find you want to select a different image simply use the film strip along the bottom of the screen, clicking the required thumbnail. The Develop tools down the right used to adjust your image and which we are looking at in this article. The first thing I do when processing my RAW files is to select the camera profile to be used in the conversion process. This is located under the “Camera Calibration” section found at the very bottom of the development tools panel as can be seen in the screen shot below. 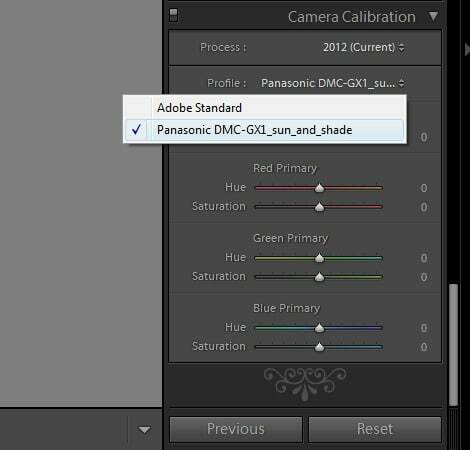 The default camera profile that ships with Lightroom is “Adobe Standard” and is responsible for controlling how the data in the RAW file is translated into colours in the finished image. Depending on your camera make and model you may find other profiles also listed in the drop down. If your camera has other profiles available its worth checking these as they may be a lot better than the Adobe Standard profile e.g. when I am processing images from my Canon 5D I find I prefer the “Faithfull” profile to “Adobe Standard” with around 95% of images. If your camera doesn’t have other profiles it is possible to create custom profiles using a colour checker card. This does require some additional software as well as the colour checker card but it can often provide a significant improvement. Whilst I don’t cover how to do this here I am planning to publish an article on my Lenscraft website in the near future. Having selected the correct profile for my camera I know that the colours and tones will be reproduced accurately as I make my adjustments. I then continue by making initial adjustments to the Colour Temperature, Exposure and Contrast settings. These are found at the top of the tools panel just below the Histogram. I am assuming you have calibrated your screen. If your screen isn’t calibrated you will not make good judgements about how your images look. You need to have confidence that your screen is representing colour and tones correctly so you can decide if something it too dark, bright, saturated etc. When making changes you need to use the histogram to help you e.g. ensuring you don’t lose shadow detail, have a good range of tones etc. BUT you also need to consider the type of image and how it looks on the screen. For example, if you have a low key image it’s no use manipulating the file so that the tones are spread evenly across the histogram or grouped into the mid tones. A low key image should have the majority of the histogram gathered in the bottom quarter (left hand side of the histogram). 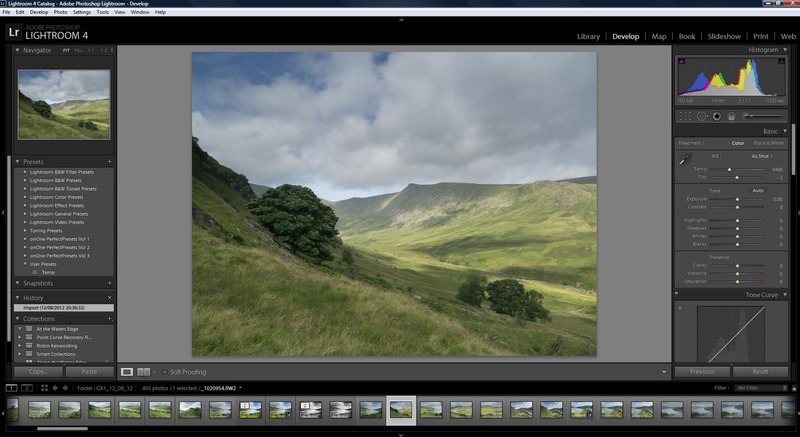 The screenshots in this article are from Lightroom 4.1 and look different to previous versions of Lightroom. If you are a Lightroom 4 user and you start to process a RAW file that was imported into your Lightroom catalogue using an earlier version, Lightroom will provide a warning in the lower right part of the image asking if you would like to update to the latest processing. If you chose not to update, your display will resemble that in Lightroom 3. You can switch between the different processes and hence views using the Camera Calibration panel shown previously. The very first item in this panel shows the process which for Lightroom 4 is “2012 (Current)”. Click this and you can select one of the earlier processes. The screenshot below shows some of the basic Colour Temperature, Exposure and Contrast controls available as well as the histogram. The first adjustments I like to make are to the Exposure and Contrast sliders. 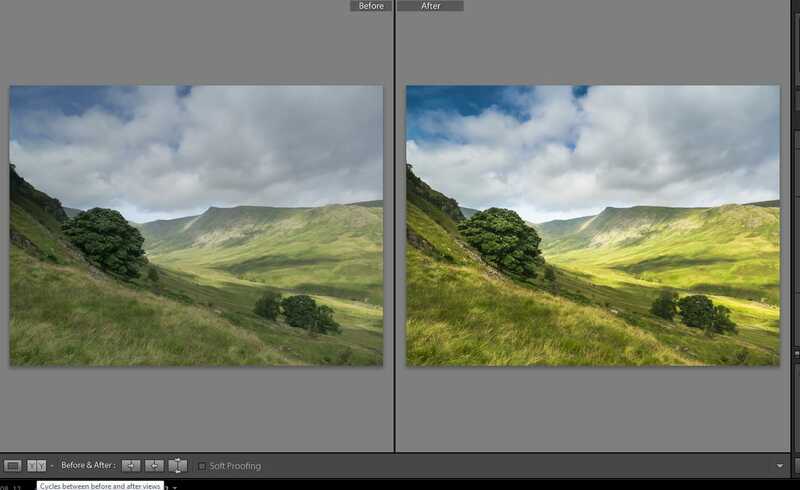 Once I know I have these correct I find it easier to judge other changes required such as colour and saturation. I start my workflow with all my settings “zeroed” and have set up my version of Lightroom to automatically “zero” the settings when importing RAW files from this camera. An alternative is to use the “Zeroed” preset in the panel on the left side of the screen. This is one of the default presets which ships with Lightroom and when you click on it, it will remove all adjustments for the current image. In order to get the most from the develop module it’s important you understand how the changes you make will affect the histogram. Without this you will probably become rather frustrated as I did when I first started using the application. “Exposure” slider – affects mainly the mid tones (middle) of the histogram. It also affects the highlights and shadows (left and right) areas to some extent. Move the slider to the right and you will see the mid tones start to push up to the right of the histogram. You should also notice that the highlights start to move up to the right of the histogram as do the shadow tones on the left of histogram. “Contrast slider” – is very important and will simultaneously extend the shadows to the left and the highlights to the right stretching out the histogram at either end. The other sliders used to control exposure are the “Highlights”, “Shadows”, “Blacks” and “Whites”. If you haven’t already noticed, when you hover over the exposure sliders, different sections of the histogram are highlighted so you can see which tones will be adjusted by which sliders. “Blacks” slider – controls the tones at the far left of the histogram. Even if there are no tones in this area for your image you can force the darkest part of the image into this region by moving the slider to the left (although the Tone Curve tool may be a better way to do this). Equally you can lighten areas that are clipped by moving the slider to the right. Don’t forget that most images benefit from having at least some areas that are pure black. “Whites” slider – this is similar to the “Blacks” slider except it affect the tones at the far right of the histogram. “Highlights” slider – adjusts those tones that are slightly darker than those affected by the “Whites” slider. “Shadows” slider – adjusts the tones slightly lighter than those affected by the “Blacks” slider. Using these sliders it’s possible to make significant adjustments to the histogram. But if you don’t like using the sliders or are not yet certain how they work together there is an alternative. It’s possible to click on the histogram in the tonal range you want to adjust and then drag the histogram to the left (to make it darker) or the right (to make it lighter). 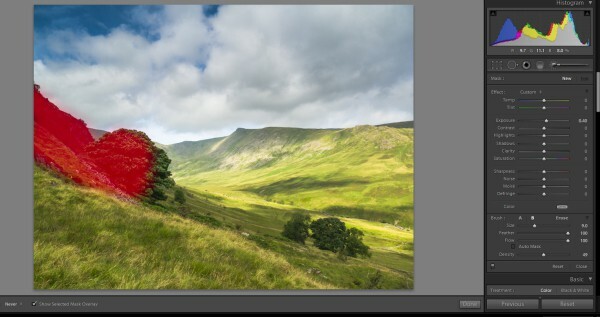 Lightroom will respond by moving the sliders for you. Once my tonal range is correct I turn my attention to the colour temperature. This is adjusted using the “Temp” and “Tint” sliders and again you will see the results on the image and the histogram. Start with the colour temperature moving the slider to the left to give the image a cooler blue feel. Move the slider to the right and the image becomes warmer. The “Tint” slider can be user to shift the colours to emphasise green or pink. As you move these sliders you will see the different colour channels in the histogram respond. In the course of making these adjustments you might have noticed two triangles, one at either end of the histogram. These are warning triangles are highlighted when one of the histogram channels starts to become clipped because it has become too dark or light. If you see this happen you can click on the triangle and the area where the channel is being clipped will be highlighted on the image (the default is blue for shadow clipping and red for highlight clipping). You can see some shadow clipping in the screen shot below where I have made the shadow areas so dark they have become pure black pure black, losing all detail. Clicking on the triangle to the top left of the histogram has highlighted the problem area in blue (shadows in the tree). In this instance I’m not worried about the possible loss of detail but if you find it’s a problem in your image simply move the “Black” slider to the right to lighten these tones. Having made these basic adjustments, the image will usually be looking quite good but it can usually be further improved by adjusting the “Clarity”, “Vibrancy” and “Saturation” sliders. The Vibrancy and Saturation sliders adjust how saturated the image appears but work in slightly different ways. I find it best to start with the Vibrancy slider and then use Saturation. You should also ensure you have made all your contrast changes (Contrast and Clarity sliders) before adjusting the image saturation as increases to contrast boost saturation. The Clarity slider adds contrast to the mid tone area of the image. I suspect it’s called Clarity because adding contrast in this tonal range often makes details in the image appear crisper and sharper. An interesting alternate use for this slider is to move it to the left, which tends to give images a dreamy, misty appearance. With most images it’s easy to have areas that are too light or dark and which need to be adjusted. 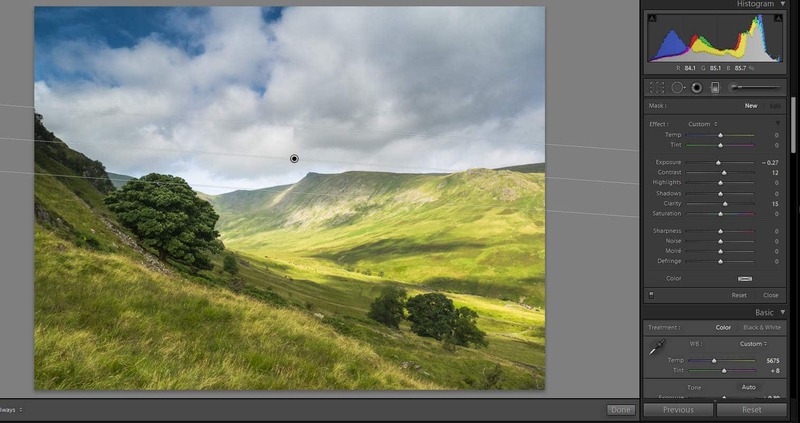 Lightroom offers two tools to make localised adjustments; the graduate tool and the brush tool. In my image I feel the clouds are too bright so I have selected the graduate tool (second icon from the left in the row just below the histogram) to allow me to adjust them. The tool is intuitive and is just like drawing a graduated filter on your image. You simply click on the first point and drag down to a second point before releasing. As you drag out the graduate you will see parallel lines to indicate the start and end of the graduated area as shown in the screenshot below. Anywhere above your first click will receive the full strength of the adjustment. Anywhere below the bottom line will be unaffected by the adjustments. By moving the mouse to the left or right when you drag out the adjustment it is possible to angle the area of graduation. Once you have your graduate in place you can make selected adjustments. This is done using the controls that opened (just below the histogram) when you clicked on the graduate icon. The most obvious is to adjust the exposure to darken down the sky but there are plenty of other controls you can use here. In my image I decided to darken the sky slightly but also increate the saturation slightly as well as the clarity. One of the side effects of increasing clarity is that any luminosity noise in the area is also enhanced so there are tools to adjust this also. Lightroom 3 only offered limited adjustments so version 4 is a big improvement. The other localised adjustment tool is the adjustment brush. This offers the same controls as the graduate tool but offers greater flexibility in selecting the areas to be adjusted. Using this tool you simply paint over the area you want to adjust. You can see this in the screenshot below. You will notice that I have selected to show the Overlay mask (shown in red) as I paint so that I can judge the area affected. This option is found just below the image on the left of the screen. Once I have made my selection I uncheck this option so I can see my adjustments. In my image I have chosen to lighten the shadow area of the tree and the mountainside to the left of the tree which also fixes the shadow clipping. With the adjustments complete I can compare my new image with the original. This is easy to do using the icon at bottom left of the screen just below the image. The icon shows two boxes side by side with a Y in each. Click on this and you can see the two versions of the image side by side. As you can see from the screen shot above you can achieve substantial improvements to an image by using only a few basic adjustments.